RBCommons 3.0 : Beanbag, Inc.
Not all comments are tied to lines of code. 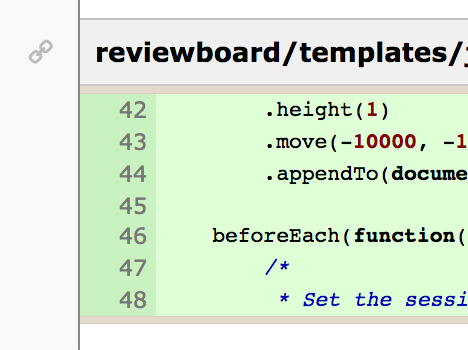 You can now add General Comments, which can apply to a review request as a whole, or to some part not otherwise tied to a line of code. You may use these to point out a typo in a review request's description, or to mention files that are missing from a change, or to discuss higher-level architectural changes. 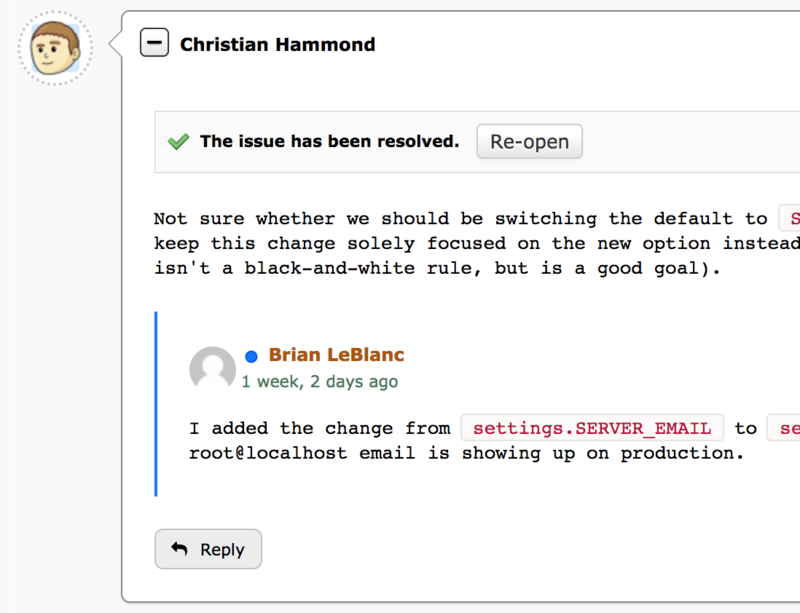 General Comments can open issues, like any other comments, letting you track important blockers for a change. To file a General Comment, click Add General Comment in the review request's action bar or in the Review Dialog. When opening an issue for a comment, the issue can now be set to require verification. The author of a change can still mark an issue as Fixed or Dropped, but it won’t enter that state until the reviewer verifies the resolution. This helps give the reviewer confidence that the author won’t either accidentally fail to address the issue or close it and then land the change without addressing the feedback. The “Ship It” label on reviews now has a little X button that, when clicked and confirmed, will revoke that Ship It, removing it from your review. This can be clicked by either the reviewer or the owner of the review request. It’s handy when you realize your Ship It was premature, or no longer applies to the review request. The ownership of a review request can now be changed by either the review request’s current owner (i.e. the submitter) or an administrator. This allows review requests to be transferred from one user to another if they’ve been abandoned or the work has been handed off. For users who have the right permission, the Owner field under a review request’s Information section can now be edited. If a regular user is making the change, they can give away ownership but cannot reclaim it later (that is, it must be reassigned back by the new owner). In large teams, the amount of e-mail traffic generated by code reviews can be significant. Sometimes, the contents of a code review can be trivial or direct enough that it’s really not worth notifying everybody about the change. In this case, you can now select to publish the review and only e-mail the owner. This will still show up in the web UI and update on people’s dashboards, but nobody else will receive the e-mail. The review dialog now displays a delete icon next to the edit icon for each comment. This allows diff comments, file attachment comments, and general comments to be removed without finding the original comment flag or discarding the entire review. Any new updates, reviews, and replies made to a review request since last viewing the page are now highlighted, making it easy to see what discussion you need to catch up on. New entries on the page (such as changes to a review request or new reviews) show up with a blue border around the entire entry and a blue dot icon in the summary, providing a quick visual that it’s fresh and new. New replies on reviews are also specially highlighted, with a blue dot beside the user’s name and a thick blue border to the left of the comment, which helps it stand out when scanning for new discussions you want to catch up on. Reviews and updates will also be collapsed automatically if it's content you've already visited before, and expanded if there's something new to see. It’s now easy to link to reviews, updates, and comments on the review request page. The timestamp fields for the page entries now work as links to that entry, and hovering over comments or replies will show a link icon to the left that can be used for linking to that specific comment or reply. Users can now use Emoji shortcodes (like :smile:) in any text field with Markdown enabled and they’ll be turned into Emojis when viewed. These have an advantage over Unicode-based Emojis in that they’ll work regardless of the database settings (MySQL databases by default do not support Unicode-based Emojis unless using some very specific encodings, table formats, and settings, none of which are default). You can now add images to your responses by drag-and-dropping them into text fields (when editing in Markdown mode). This makes it easy to share mock-ups or annotations within your discussions. Images can be added to diff comments, file attachment comments, general comments, review headers, and even in a review request's Description or Testing Done fields. RBCommons can now send you desktop notifications when there's been a new review, reply, or update on a review request, so long as the page is still open in your browser. This requires granting permission when asked by your browser. We’ve switched to a new blue dot icon across the product for representing updates to a review request or discussion. In the Dashboard, this replaces the old comment bubble icon. For Ship Its, we’ve switched to a new “thumbs up” icon, replacing the old checkmark (which was also used for issue tracking). The Open Issues icon remains largely the same, but is a lot sharper and more clear. The review request counts in the sidebar are now a shade of blue instead of red, based on feedback from some users that the red suggested something was wrong. When hovering over the summary of a review request, a box will appear with details on that review request, showing the summary, description, owner, information on reviews, and more. You can hover over this to quickly navigate to the diff, scroll through the description, or get additional information. By default, we use Gravatar for all avatars, but you can supply your own custom image through the My Account page. Simply choose "File Upload" to browse for a custom avatar, or drag-and-drop one. Deleted files have typically just been listed as deleted, with the content hidden. You can now choose to see the content of these files, letting you point out something important from an old file that may have been missed. If a patch fails to apply correctly (either due to a bad patch or a problem with the configured repository), you'll now see information on that failure, including any rejected lines from the patch. This will feature a download link for fetching the original file, patch file, and the rejects, for your own inspection. When viewing a file attachment, you can now easily navigate to the next attachment in a list. Along the sides of the page, you'll find "Previous" and "Next" buttons. Hovering over these will show a thumbnail for the attachment, and clicking will take you to it, without having to jump back to the review request page. With the advent of high-DPI screens, it’s common for screenshots or image assets to have a 2x or 3x ratio between display pixels and virtual pixels. In order to facilitate review of these files, the image review UI now allows selecting a zoom level (either 33.3%, 50%, 100%, or 200%). These presets allow easily viewing 2x or 3x assets at their natural size. If the image attachment filename includes “@2x” or “@3x”, the correct zoom level will be preselected when opening the file. Otherwise, the image will be zoomed such that it attempts to fit within the browser window. When reviewing very large image file attachments (such as whole-screen screenshots), they would previously overflow the bounds of the containing box. These will now be contained entirely within the review box and can be scrolled.